A few years ago when Anna was assigned to memorize the Priestly Blessing in Hebrew it was an opportunity for me. I would finally bless my children on Friday nights with those famous words without a cheat sheet, or mumbling so my kids wouldn’t realize how poor my Hebrew is. Blessing one’s children reaches back to biblical times. In the Torah Isaac blesses his sons and Jacob blesses his children as well his grandchildren. One of Aaron’s last acts as the High Priest is to bless the children of Israel. And Moses blesses each of the tribes of Israel. During rabbinic times parents adapted this biblical practice by expressing their pride and love for their children with the Priestly Blessing. There is nothing sweeter in this life than blessing one’s children especially on a Friday night. When Anna and Adam were little I’d drop to my knees to so that they could look into my eyes and tacitly understand that blessing them was an act of thanksgiving and humility for me. I recently learned that there are also special hand gestures that accompany the Priestly Blessing. Like the prophets of yore, the kohanim or priests stretched their arms forward (with an outstretched arm!) with their hands palms-down. They also split their fingers so that, counting the space between the opposing thumbs, there were five spaces for each hand. Another allusion. My reading led me to a reference from Song of Songs 2:8-9 which states that God “peeks through the cracks in the wall.” God watches, God protects, God blesses. Now when I fan my hands on Anna and Adam’s heads, the spaces between my fingers are filled with their goodness, their innocence, their strength and my fragility. For a while my kids were very clear that this blessing business was not exactly their favorite part of our Friday night festivities. “Do it more quietly,” Anna said. “I don’t think you have all the words down,” Adam said. But I persisted and tried not to let their tween behavior dampen my joy. Recently I hit on a time-saving method acceptable to both my children and me—blessing them together. After the initial blessing I turn to Anna and ask God to make her strong and wise like Sarah, Rebekah, Rachel and Leah. Then it’s Adam’s turn and I ask God to make him a role model like Ephraim and Menashe. I think that Anna and Adam don’t mind being blessed these days because they like to reciprocate. My daughter is now tall enough to look me in the eye when I place my hand on her head. My son is nine inches taller than I and has to bow his head. These days they offer me a blessing too by saying the words with me. Anna and Adam’s Shabbat blessing acquired another level of meaning when our friend Susan asked them what they thought of a blessing that asked God to make them like someone else. She pointed out a contradiction that speaks to one of my favorite midrashim about God’s challenge to Rabbi Zusya. When it came Zusya’s time to go to heaven, he had ready answers for God about why he wasn’t a great prophet like Moses or a gifted scholar like Maimonides. But he was worried that God would ask him the most difficult question of all—why wasn’t Zusya more like Zusya in this life. Exodus—“I am that I am”—the ultimate proclamation of authentically being. I appreciate Falk’s point that giving our children a strong, unlimited sense of self is crucial. But we—Anna, Adam and I—do not want to give up the ancestors. Our foremothers are not just archetypes. At different points in our lives they are us and we are them. And for me, Jacob directly blessing his grandsons rather than his sons tells me how precious and hopeful the future is. Finally, a pair of brothers in the Bible who don’t want to kill one another! Anna and I tested each other for a week until I finally got the Priestly Blessing down in Hebrew. We also assimilated the notion that in its three straightforward lines, the beauty and genius of the blessing rests in its simplicity as well as its swift movement from the material world to the ultimate wish for peace. 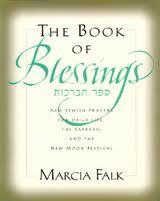 This entry was posted in books, family life, Jewish feminism, Judaism, Parenting by judy bolton-fasman. Bookmark the permalink. Beautiful peace, Judy, though I am so tired and hungry I first read bless your children as bless your chicken. Once I got re-read it correctly, it made a lot more sense and this is is so lovely!